To establish Integrated Practice Units for mental health screening and treatment services into existing tuberculosis programs. With an estimated 510,000 new tuberculosis (TB) cases each year, Pakistan is ranked fifth among the highest burden countries for TB worldwide1. Tuberculosis control is a prominent public health priority within the country. In line with WHO’s ‘End TB Strategy’2, a focus on more innovative methodologies and integrative treatment approaches are needed to address the public health challenge. 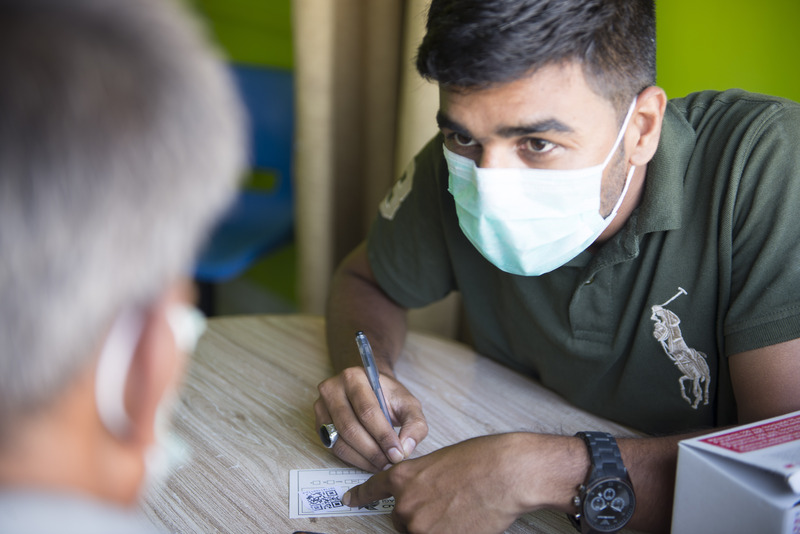 Generating more evidence to understand the relationship between TB treatment non-adherence and co-morbid mental conditions can inform new approaches to more effective and holistic care of TB-affected populations. Existing literature on the relationship between TB and mental health suggests that patients with TB are at a higher risk for depression and anxiety, with prevalence estimates ranging between 42% - 52%3-4. The evidence for elevated rates of mental distress in populations with chronic conditions indicates a dire need to provide mental health care services to these patients. Evaluating the process of integration is essential in generating evidence on best-practice techniques to improve mental health service uptake and effectiveness as well as treatment outcomes for chronic conditions in Pakistani healthcare settings. “This work highlights the importance of providing mental health care services to chronically ill patients, in order to have a positive impact on treatment outcomes” – Aneeta Pasha, PI. An Integrated Practice Unit (IPU) model5 was utilized to embed mental health screening and counselling services within existing TB treatment healthcare programs. It utilizes a task shifting approach and uses lay counsellors for mental health service delivery. Integrated practice units (IPU) offering mental health services were developed across public and private hospital settings in Karachi, Pakistan within six TB facilities (Sindh Government Hospital-Korangi, Sindh Government hospital-New Karachi, Jinnah Postgraduate Medical Centre, Indus Hospital-Korangi, Sehadmand Zindagi Centre-Korangi, Sehatmand Zindagi Centre-Malir). Prior to the operationalization of the IPUs a batch of 10-15 lay health counsellors attended an intensive six-day training on mental health counselling. The training was conducted by a psychologist and focused on signs and symptoms of common mental health disorders, basic cognitive behavioural therapy techniques, stigma reduction, communication skills and mental health screening. The strongest candidates were selected from the training batch based on their pre and post-test scores as well as their participation and performance during the training for placement at the IPU to screen and provide free of cost treatment. Typically, one counsellor was assigned per site. Additional training focusing on TB and Antenatal care was also was also provided to the selected counsellors equipping them with knowledge related to their disease area and cater holistically to the patients at their facility. Time Driven Activity Based Costing (TDABC)6, a tool used to generate cost estimates through calculating the time required to perform activities in service delivery was conducted at three of the facilities (Indus Hospital-Korangi, Sehatmand Zindagi Centre-Korangi and Sehatmand Zindagi Centre-Malir) to evaluate the cost of incorporating mental health services through the IPU. Certain tertiary care facilities engaged for the program were high volume sites. A large number of patients visiting the facility combined with the relative complexity of the process flow made it challenging for the counsellor to track and deliver services to all the patients visiting the facility. In certain instances, the existing staff at some facilities was uncooperative and would not direct patients towards the mental health counsellor as mandated by our protocol. This was eventually resolved by repeated meetings with the facility staff and reinforcement of standard operating procedures. Data was initially collected via paper forms making the maintenance and management of a large quantity of forms unwieldy and the monitoring of records difficult. This was eventually mitigated by the development of an mHealth application. This innovation is in the process of scale up in partnership with the Global Health Directorate of the Indus Health Network (Karachi, Pakistan). As part of the move to increase coverage, the programme’s mental health services are being integrated within primary health care clinics across the county and within priority public healthcare care programs for HIV, Diabetes and Antenatal Care. The program also evaluated lay health counsellors performance and retention of material after training through pre- and post-tests and role-playing exercises. Patient progress was closely monitored and they were reassessed on the AKUADS at the 4th and 6th session to evaluate the effectiveness of the intervention. The administration of Time-Driven Activity-Based Costing (TDABC) estimated the operational cost of providing mental health treatment (4-6 counselling sessions per patient) as less than $USD 10 per patient. 522 TB patients with Depression and Anxiety symptomology were administered 4-6 sessions. Preliminary findings from the project suggest some evidence for a positive relationship between mental health counselling for depression and anxiety and improved TB treatment outcomes. More conclusive results are expected after the final evaluation of the programme additionally including health centres for diabetes and antenatal care. I am trying to find measures of treatment progress for the client to fill out. Like the PHQ-9 for depression might work for depression. looking for a more general measure of progress in mental health treatment. Any suggestions much appreciated. working in Afghanistan.